I have only one regret about deciding to drive through Bosnia to our destination of Dubrovnik: that we only passed through. Bosnia is a beautiful, scenic country. I actively watched the passing countryside through the window from the moment we entered the country until the moment we left it. The roads were winding and twisty, so both Stephen and Quentin were a little car sick throughout the journey. Roads traveled up mountains and down mountains, followed sinuous, emerald-green rivers and passed through one healing community after another. Bosnia actually felt a lot like home…lots of dense forests, open pasture-land and impressive river canyons. It reminded me of the Fraser Canyon in spots, Douglas Lake Ranch in others, and Duffy Lake Road at times. The big difference was the obvious trauma that each community went through during the war in the nineties. Houses were either freshly plastered and painted, pock-marked from bullet fire, or utterly demolished. Every community had at least one cemetery. I specifically looked for them, recalling the shape of the stones for either Muslim or Christian victims from documentaries I’d seen. 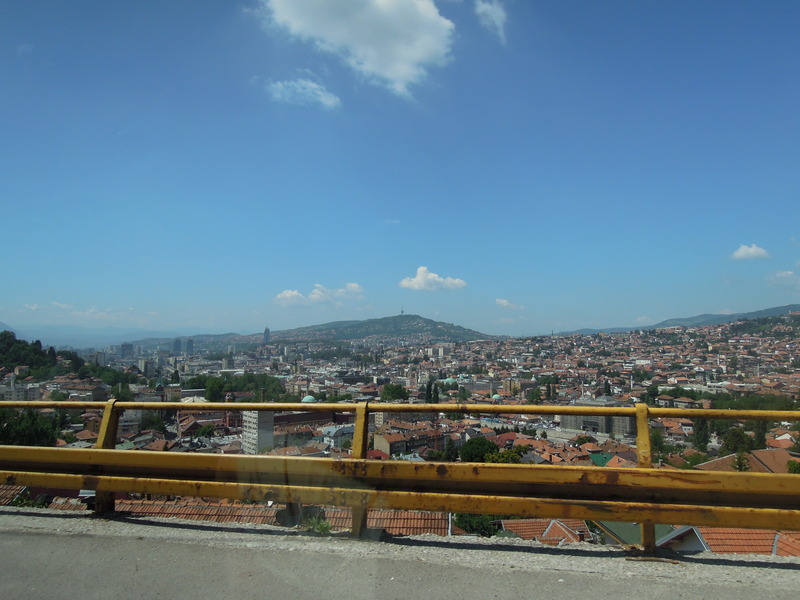 Sarajevo’s hillsides were bristling with them. I felt a little bad for searching them out, but I just couldn’t help it. When we were descending the mountains into Sarajevo on a narrow, single-lane road, I understood how easy it would be to trap the citizens the way they were during the siege. I imagined the position of snipers and could see how they were able to pick out people as they crossed the streets below. We only stopped briefly in Sarajevo to have a bite of lunch. It was an interesting city to even see at a distance–beautiful, set in the middle of a ring of mountains, and recovering. We also stopped for an hour in Mostar, which had also been devastated during the war. 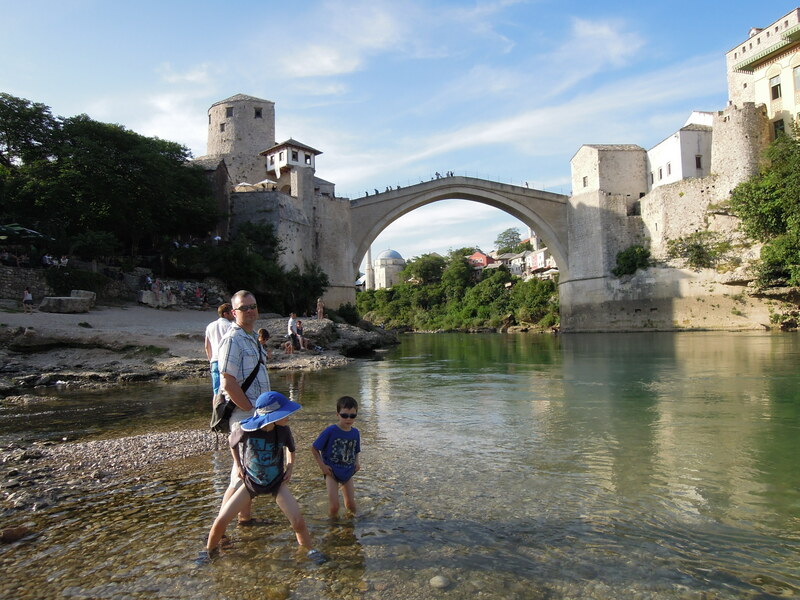 The biggest wound to the little city was the destruction of the graceful, 500 year old bridge spanning the Neretva River. We walked the rebuilt version of the bridge, which is still breathtaking even though it is a replica. The people of Mostar have worked to restore many of the buildings along the river, especially those that are clustered around the bridge. However, if you walk beyond this small area, the damage to the rest of the town is just as breath-taking as the scenic beauty of the bridge. It is terrible to think that citizens of the same town directed such hatred towards one another, but it allows you to really cheer on the light, happy, tourist atmosphere of the town today. 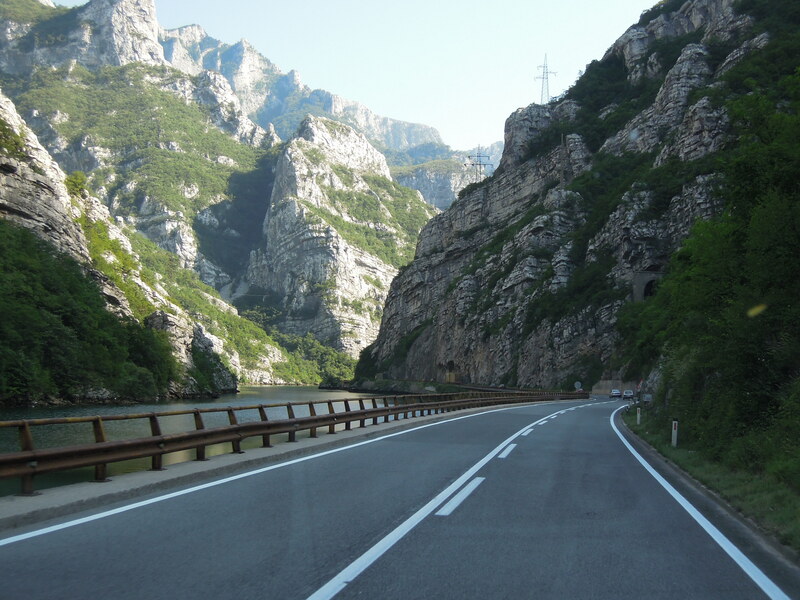 I forgot to mention that we hired a driver to take us on this journey through the mountains. We feel like we get the place now and would not hire a driver the next time we return. And we really will return. We really need to take our time and do it properly.